OKLAHOMA CITY (AP) – Gov. 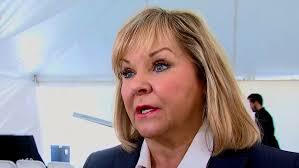 Mary Fallin says she will retire from politics when she steps down as governor in January and will not pursue elective office again. Fallin later was elected the first female lieutenant governor, a position she held for 12 years. She then served in the U.S. House of Representatives for two terms before being elected in 2010 as the first female governor of Oklahoma. Fallin and her husband, Wade Christensen, have six children and recently welcomed their first grandchild.